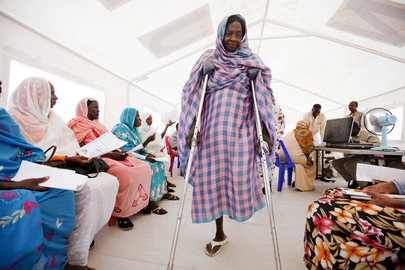 A woman, who is handicapped from the Darfur conflict, participates in a reintegration programme held at the National Service Camp in Nyala (South Darfur). Disarmament, demobilization and reintegration (DDR) constitute an integral part of post-conflict peace consolidation in Sudan. The work is undertaken by the African Union/United Nations Hybrid Operation in Darfur (UNAMID).